Minimalism is quickly becoming our closest friend. We moved out of our house four days ago into my mother-in-law’s house. The move went as well as could be expected. We cleaned the house and packed up all the belongings (those we still had not sold, those we will take with us or those we will store while we are away). We put five large crates in our friend’s (Kristine) garage and the rest we took to the in-law’s house. Four beds in one room. One suitcase. Can we possibly minimalize more than this? 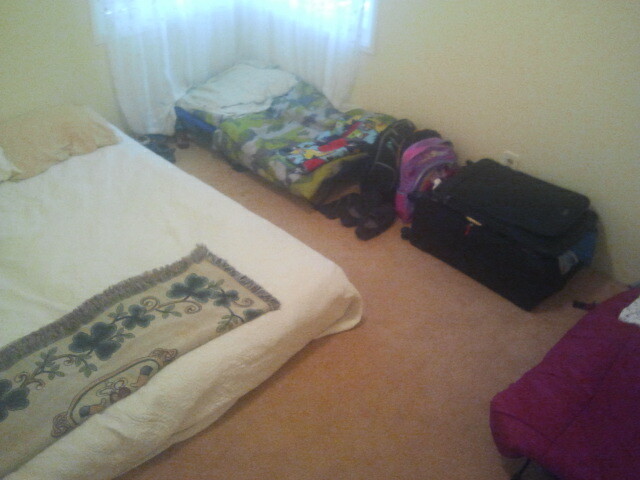 For the past four nights, we’ve been sleeping in one room, the five of us. Does this sound a little cramped to you? As Americans, we like having personal space. Being too close to people makes us feel claustrophobic. However, I have found this opportunity to be very sweet. I get to sleep in a room with my children. My youngest lays next to my wife and the other two are just feet away from me. If they wake up in the night and are scared, they know I’m nearby. Everyone feels safe and loved. We have literally been living out of one suitcase during this leg of the journey. My wife, in her wise minimalist thinking, packed all the clothes we would need for the next few weeks into one large suitcase. It is actually working. We normally have to run the laundry every four days anyway. Living with four changes of clothes, rather than be an inconvenience, has freed up our space and time for things that matter more. 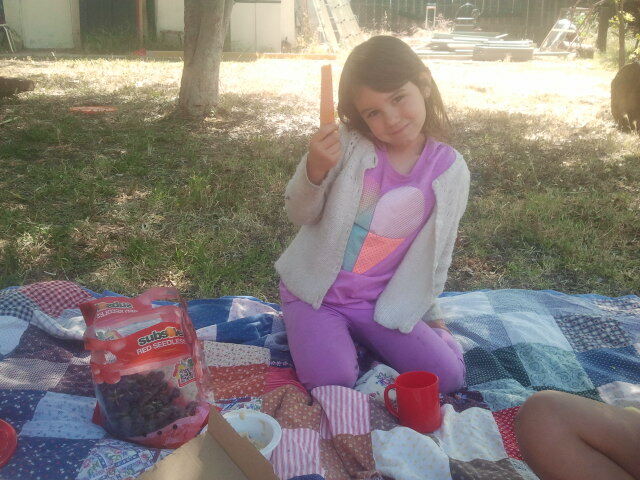 The princess having her healthy afternoon snack with a new friend from across the street; Carrots, grapes and hummus. We have actually been managing to eat healthy during this time as well. I can see, however, why many find it difficult to choose healthy options when life is full of stress. It really does take a lot self-control and prioritization to plan ahead, go to the store, and prepare the food when you’re trying to make life work. I won’t pretend to understand the lives and stresses of those who live under the poverty line, but I like to think that our current life situation has made me at least slightly more sympathetic to the struggles they face. The temptation to go back to processed foods and eating out in order to save time and alleviate the stress is difficult to resist. This time has presented some challenges so far. It is too early to say that the habits we’ve adopted over the past year will will stand the test of time. However, I’m very pleased with our progress. The minimalist pursuits we began just under a year ago have not waned with the oncoming stresses of life, but rather have made this process possible. Our healthier choices of eating have continued to stay strong as well, albeit with much more ice cream consumption these past few weeks (it is my kryptonite). 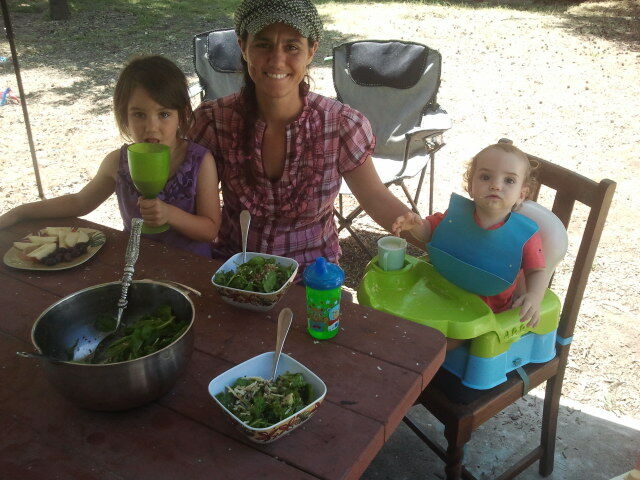 Enjoying salad al fresco on the back patio. Nothing like sunshine and a picnic table. All these people were still living by faith when they died. They did not receive the things promised; they only saw them and welcomed them from a distance, admitting that they were foreigners and strangers on earth. People who say such things show that they are looking for a country of their own. 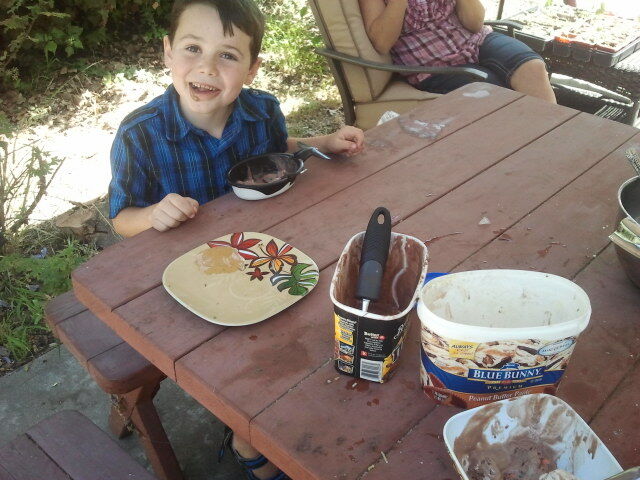 Salad for lunch means there’s more room for ice cream! That country for us is not defined by geopolitical boundaries. It consists of two simple words: Good Life. And we’re right in the middle of it. For more information on minimalism, we recommend Clutterfree with Kids or Simplify by Joshua Becker.